Hey! A quick note to tell you that Cass and I bought a house! We close on July 27, and the house is quite move in ready. I'll be tricking out the new studio area to be able to create SO much more. Need booking help? I run a booking agency called Demo Charm. Also trying to start a blog over there where you can listen to song demos and final album versions side by side. BANDS, get at me. Let's do work. I've been chatting with some other creative types about some big projects for the near future. Keep tabs on Patreon. The month we've got studio time booked for Phantom Heart and Pop Rocks. As well as tour journals, flying with boats & 23 shows in 31 days this July. Oh man. The hustle is real. Love + peace to you. I hope you are working towards the life you want. I am, and it's being made possible by people like you. New blog post on Patreon. Help me decide which songs to bring into the studio. I added some additional rewards for joining Patreon. Also, a throwback vid of Bill Wither's Lean on Me! 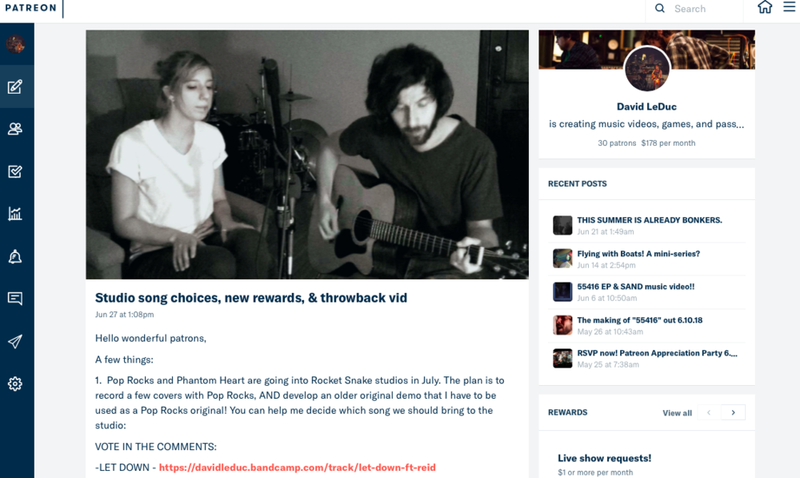 Get personalized rewards, and see all of my original music before anyone else: DLD's Patreon campaign. Now that the sister EP's are out into the world. My attention turns back to my cover bands. I'm playing 22 shows in June alone. It's gonna be a crazy summer. All shows are at themtvs.com/shows. I'll be releasing a new single called Slow Burn this fall. It will be part two of 2 videos I did with director Paul Von Stoetzel. It features CREEPS from the haunted basement. It will be out just before Halloween. Spooky. Thanks to everyone who came to Mortimers for the Phantom Heart show. 33 feels alright to me. I've been thinking lately about nicknames. How they 'stick' to people even if they don't want them. They also can tell you how and when a person knows you from. I recently saw a friend from high school and called her Tammy in front of her friends. They all looked at her funny and go, "HE KNOWS YOU AS TAMMY???" I love being called DLD. It's a nickname I got from working at Hell's Kitchen. Most of my family called me David. There's like 2 people that call me Davey. A lot of the guys I play football with and bandmates call me Dave, or LeDuc. I like em all.